For the students studying chemistry, you won’t find a more convenient storage area for a resource essential to chemistry studies than the Periodic Table Pen. This pen holds a periodic table of the elements on a spring-rolled chart. The chart also features an alphabetical list of elements, their symbol, and atomic weight on the back. This is ideal as a gift or student prize. Put you company name on the periodic table pen barrel with one color, or even printed on top of the chemical elements periodic table with full color offset proccess. It's long last promotion of your company to students as long as they keep the periodic table pens. Bayfan’s periodic table pen combines a decent quality smooth handwriting retractable ballpoint pen with rubble cushion at grip and a full color offset printed self-retractable flyer sized up to 180*168mm. With this periodic table pen, your promotional flyer is no long one time usage. Based on Bayfan’s decent design and high quality, this periodic table pen gonna work for really long time. Once your potential client gets this periodic table pen, it will be with him for quite a long time. This black ink pen hides a roll-out Periodic Table. On the front side is a full color Periodic Table. The back side features a plethora of science facts including common conversion factors, physical constants, gas laws, etc. 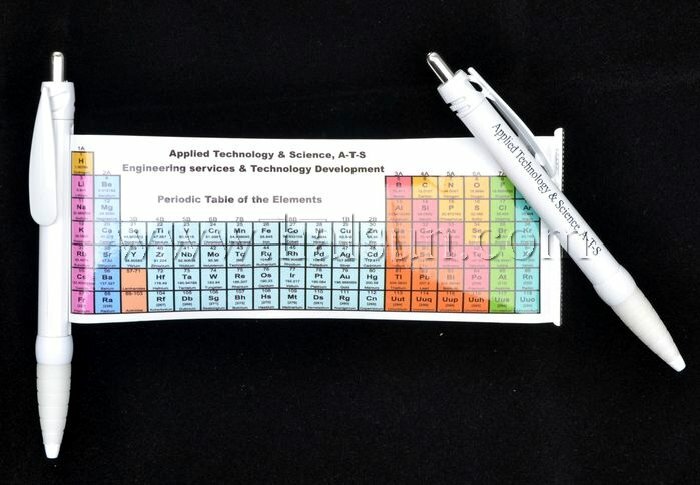 Order your customized periodic table pens today at bayfan.com! Delivery time will 4 weeks to your door by courier like DHL/Fedex/UPS/TNT. If you are in hurry, we also offer 15 urgent delivery service.